The Mangahanea Marae is located in Ruatoria, a township on the East Coast of the North Island of New Zealand, 130 kilometres north of Gisborne city. Mangahanea Marae is the Papatipu (foundation, land catchment) of the descendants of Ngāti Porou and Ngāti Uepohatu iwi (tribes) through the marriage of Hinetapora and Te Rangikaputua. Their descendants are connected to the hapū (sub-tribes) of Uepohatu, Te Aitangā o Materoa, Hauiti, Ruataupare and Te Whānau o Umuariki. The land on which the Mangahanea Marae is sited was established as a Māori Reserve under the Natives Purposes Act 1937 on the 29 October 1947. Work began on the carvings and tukutuku panels for the Whare Tipuna (ancestral house) during the 1880’s and was formally opened in 1896. The unique carving and tukutuku adorned wharekai (Rutu Tawhiorangi) was built and opened in the late 1930’s. The craftsmen employed to build the Whare Tipuna (named "Hinetapora") were: Hone Ngātoto, Hone Taahu, Wi Tahata, Wi Haereroa and Hone Te Wehi. They all belonged to the Ngāti Uepohatu iwi which was famous for its skilled carvers. The carvings, tukutuku panels and building were 10 years in the making. Mangahanea Marae has served the community and its whānau and hapū extremely well since its establishment. The marae has hosted individuals, families and organisations in times of celebration and in times of sadness and continues to do so to the present day. Well over 100 years, the marae has hosted thousands upon thousands of locals and visitors. In 2011 the age and wear and tear on the marae and its facilities were clearly evident. The Mangahanea Marae Committee and Trustees have worked diligently over the past 8 years to establish a development and maintenance plan for the marae. 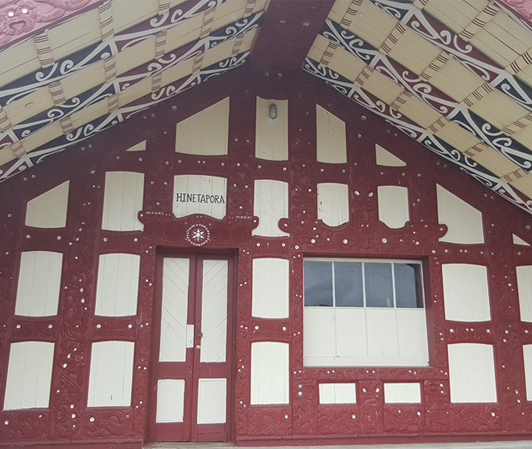 A feasibility study and a development plan were completed in 2006 which was a consideration of repairs and maintenance to the existing buildings in conjunction with modifications that provide improvements to the facilities and use of the marae. In April 2009 the marae committee was successful in lodging a Marae Heritage and Facilities Funding application to build a new marae ablution block. The new ablution block was completed late 2010 and is a significant improvement and an asset to the marae and community. In July 2011 the Marae Committee completed the Mangahanea Marae Strategic Plan 2011-2016. The strategic plan is a continuation of the development and maintenance plan for the marae. The document sets out our strategic direction for the next 5 years and clearly identifies the tasks and activities needed to achieve what we want to do. Integral to the success of this strategic plan is the continued support of our whānau, hapū and community. In order to facilitate your access to information and participation or contribution, the marae committee has established access through “Facebook” (Mangahanea Marae Pride) and this Website.